New Brunswick will be a part of Culture Days 2012, a Canada-wide celebration of culture on September 28, 29, and 30. Those who wish to take part in the celebrations can register their activities today on the national Culture Days website at www.culturedays.com. They must be free and open to the public. People are encouraged to be creative! Activities can include various aspects of culture: visual arts, music, history, photography, dance, heritage, craft, etc. Last year more than 70 activities took place in the province. The artist and great lady Shirley Bear, from the Tobique, Maliseet First Nation, will be Honorary Chair of Culture Days 2012 in New Brunswick. Shirley Bear has made influential contributions to New Brunswick’s cultural landscape. As an activist, curator and artist, she has helped to raise the public profile of Aboriginal artists. Her own paintings are admired for celebrating the wisdom, strength and spirituality of First Nations women. She is also a long-time advocate for the rights of Indigenous women in Canada, and is a role model and inspiration to members of her community. The cross-Canada celebration represents the largest-ever collective public participation campaign undertaken by the arts and cultural community in this country. The inaugural Culture Days celebration was held in September 2010 from coast to coast. Culture Days activities can be organized by cultural organizations, municipalities, artists, groups or individuals across the country. The Culture Days committee helps organizers by offering them a platform to promote their event (via the official website, social media and other promotional efforts). Various Culture Days promotional material can be downloaded from the web site free of charge. 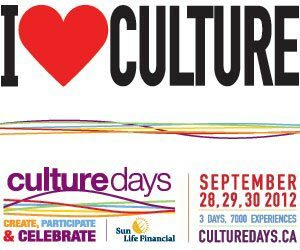 Culture Days is a collaborative coast-to-coast-to-coast volunteer movement to raise the awareness, accessibility, participation and engagement of Canadians in the arts and cultural life of their communities. With the support of a National Steering Committee and volunteer Provincial and Territorial Task Forces, thousands of activity organizers self-mobilize at the grassroots level to present and coordinate free public activities that take place throughout the country over the last weekend of September each year. This is a syndicated post. You can view the original post here: New Brunswick will celebrate Culture Days 2012.